The image above shows the aftermath of a stellar explosion of epic proportions that happened 25 million years ago in an odd-shaped galaxy that may have merged with a second galaxy, while saber-toothed cats and mammoths roamed the Earth. A star tens of times more massive than our sun 25 million light years away blew up in supernova explosion. The burst of light from that explosion raced through the universe to finally reach Earth a few weeks ago, when amateur astronomers, who regularly survey the sky looking for these events, noticed a small blob in the glow of the galaxy that wasn't there in older pictures. "Their images are taken for the purposes of science and merely detect the new blip," said Adam Block of the University of Arizona's Mt. Lemmon SkyCenter, who pointed the Schulmann Telescope atop Mount. Lemmon at the distant galaxy after reading about the event in the news. "But there is a captivating story behind this event that I want to tell with my picture." "NGC 3239 is a so-called irregular galaxy," he said, "because it's not your typical swirling spiral shape. The odd shape of this galaxy is somewhat of a puzzle, but it could be the result of a merger with another galaxy and all we see now is the commingled result of that encounter. "The Schulman Telescope and camera can capture a large field of view, which allowed Block to show the distant galaxy "in a grander perspective as one of many galaxies." To obtain enough light for a crisp and highly detailed image, Block combined many individual pictures that totaled around eight hours of exposure time. Remarkably, these images were collected by controlling the telescope remotely from Tucson. The brightest-looking star in this close-up image below is actually not the supernova;­ rather, it is a star within our own Milky Way that happens to be in the same line of sight. Just below and to the right of that star, three star-like dots are visible. 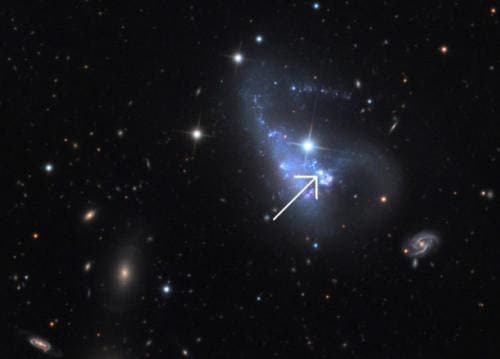 The arrow points to the brightest one: Supernova SN 2012A. "You can see it rivals every other object in its galaxy," said Block.